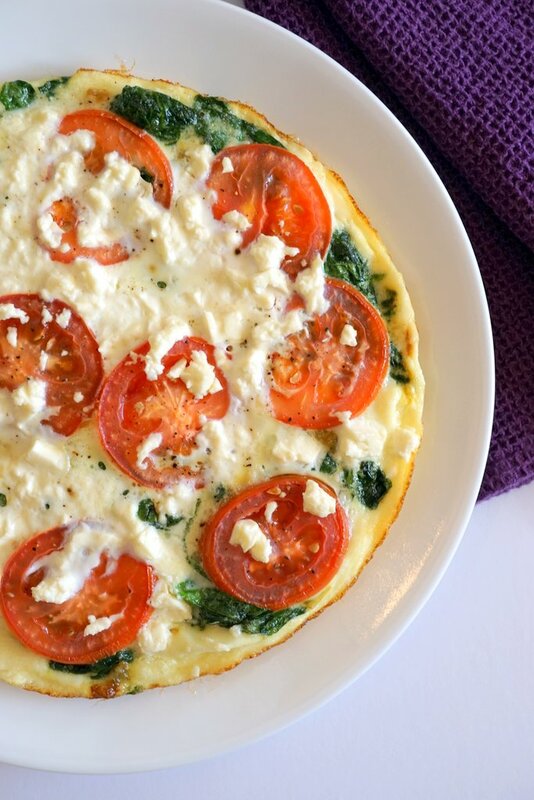 A quick and easy dish perfect for a light breakfast, brunch, or lunch. Add a sweet potato and some melon for a complete and healthy meal anytime of the day! 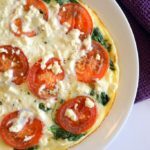 Frittatas and quiches are two of my favorite ways to prepare eggs! Quiche is cooked entirely in the oven, whereas, a frittata starts on the stovetop and finishes in the oven. The quiche wins in the “hands-off” category, but the frittata wins the “on the table quick” category! (Click here to check out my Crustless Quiche recipe!) 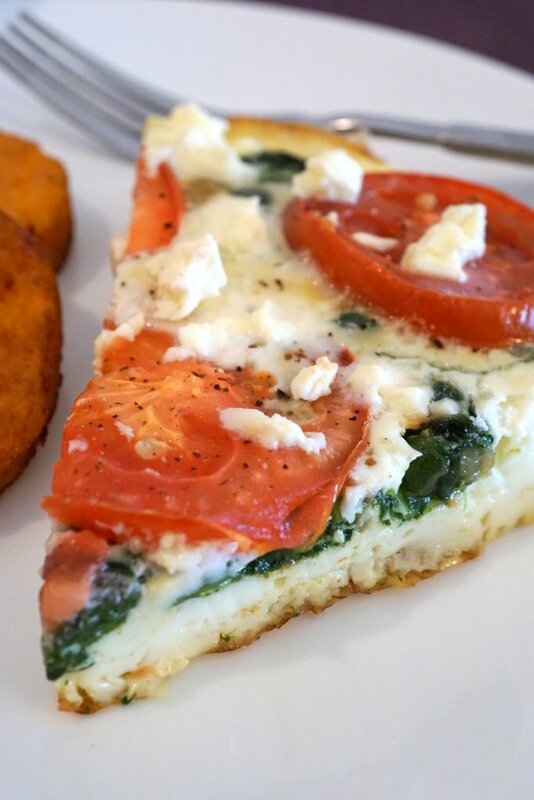 Either way, the combination of spinach, tomato and feta never disappoints! Take a look at how easy this dish is to make. Liquid Egg Whites: Nothing against the yolk, but this dish is all about the egg white! 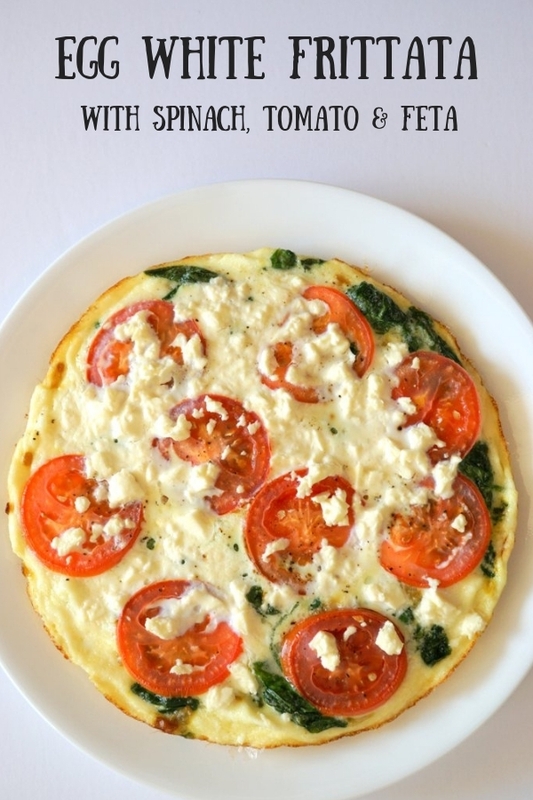 Egg whites are higher in protein than the yolk, are fat free and cholesterol free. Both the yolk and the white contain important vitamins and minerals, so I generally consume the entire egg. However, for this recipe, I’m taking a break from the yolk! Instead of cracking the eggs and separating them, I love the convenience of using a carton of liquid egg whites. 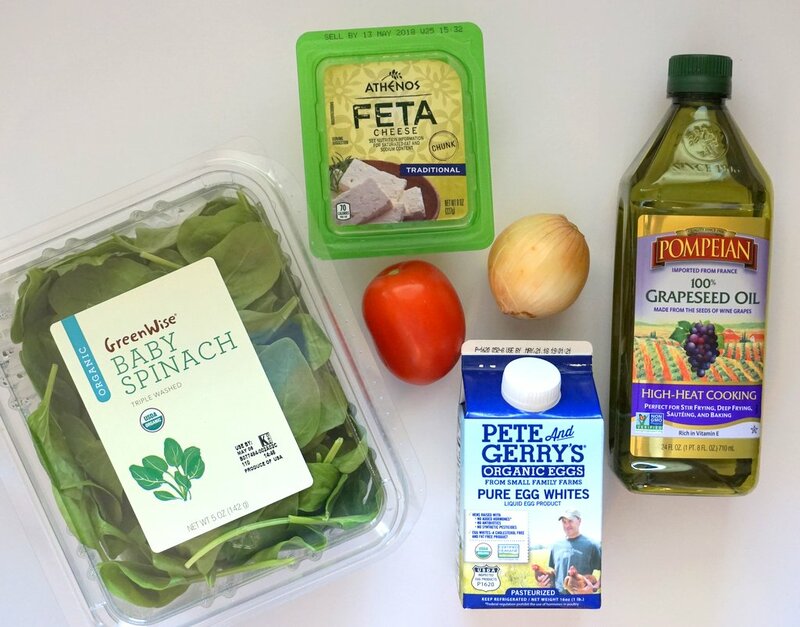 A 16 ounce carton of Pete And Gerry’s Organic Pure Egg Whites is equivalent to 13 large eggs. With a brand like Pete And Gerry’s, the only ingredient is egg whites (be sure to read the food label)! Baby Spinach: Spinach is a nutritional powerhouse, so I love to add it to recipes. It’s perfect in an egg dish! Tomato: I like to use a plum tomato so the slices are smaller. Onion: The onion will impart some much needed flavor to the otherwise bland egg whites. Feta Cheese: I love Feta Cheese! A little goes a long way since, to me, it has a strong flavor. It’s generally more cost effective to buy the chunk and crumble it yourself. Grapeseed Oil: This oil is perfect for cooking with high heat. It has a very mild flavor, so if you prefer you can always use Avocado or Olive oil instead. 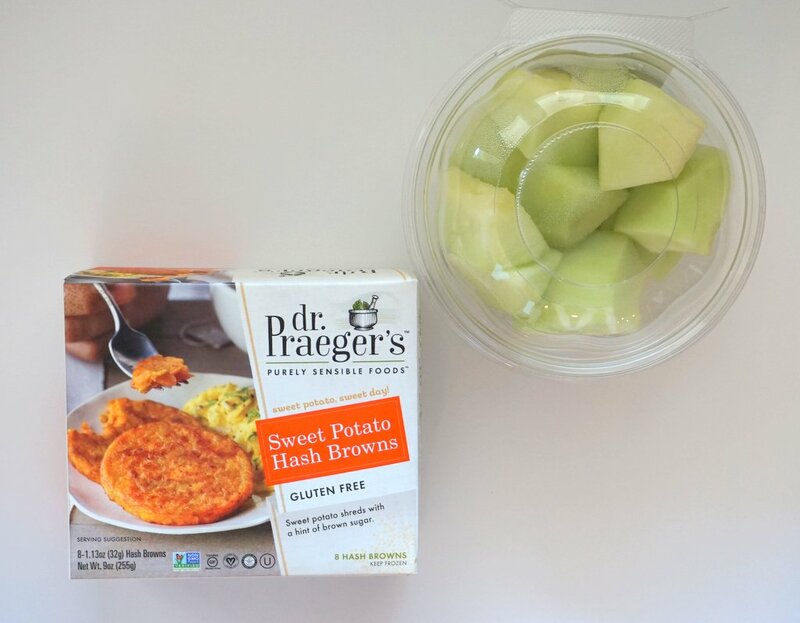 Dr. Praeger’s Sweet Potato Hash Browns: These hash browns are awesome! I’m usually not a fan of hash browns, but this version had me at “sweet potato”! They’re conveniently packaged in 4 packs of 2 and you just heat them in the microwave for 60 seconds. The ingredient list consists of “real” foods (as you’d expect from the dr. Praeger’s brand). They’re a perfect side to any egg dish! Find them in your grocer’s frozen section. You could also opt to bake or nuke a small sweet potato, adding just a touch of butter and a sprinkle of cinnamon. Honeydew Melon: Pick up a pre-cut package of melon, or any favorite fruit, to round out the meal. Chop half of a small onion, sauté the onion in a tablespoon of oil, add 4 cups of spinach, then pour on the liquid egg whites! You’ll need to lift the sides of the egg, as the bottom cooks, to allow some of the raw egg to flow to the bottom. Once the bottom of the eggs are cooked, top with the tomato slices, crumbled feta, salt and pepper, and finish cooking in the oven for about 8 minutes. The whole process takes about 20-25 minutes. A bit more time than just scrambling up some eggs, but well worth it! Especially if you want to serve a dish with a more refined look than an egg scramble. 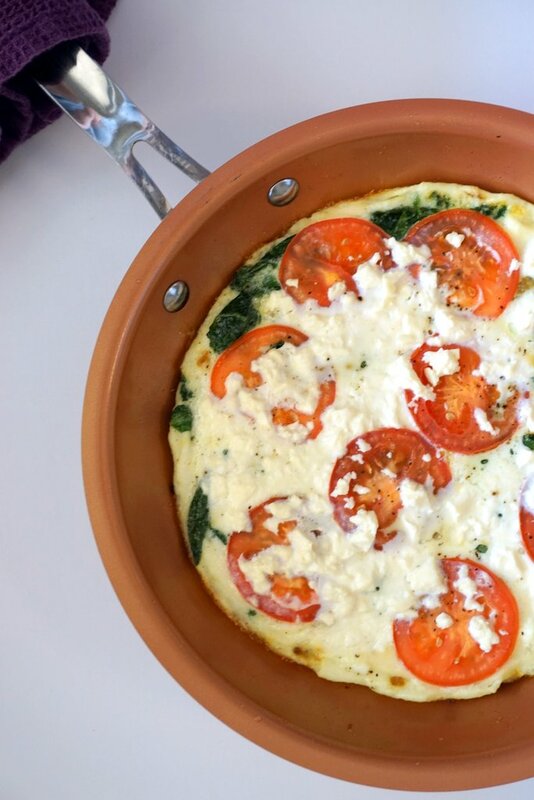 The frittata should slide off the non-stick pan and onto a serving platter with total ease. By itself, I find a frittata to be very light, and therefore not completely satisfying as a meal (although it would make a great snack)! Adding the sweet potato hash browns (or sweet potato) plus some fruit hits the mark and is perfect for a weekend breakfast, brunch or lunch! Heat the oil in a 10-inch oven proof skillet over Medium heat. Add the chopped onion and cook, stirring occasionally, until the onion is tender and slightly caramelized; about 5 minutes. Add the baby spinach, continuing to stir, until wilted; about 1-2 minutes. 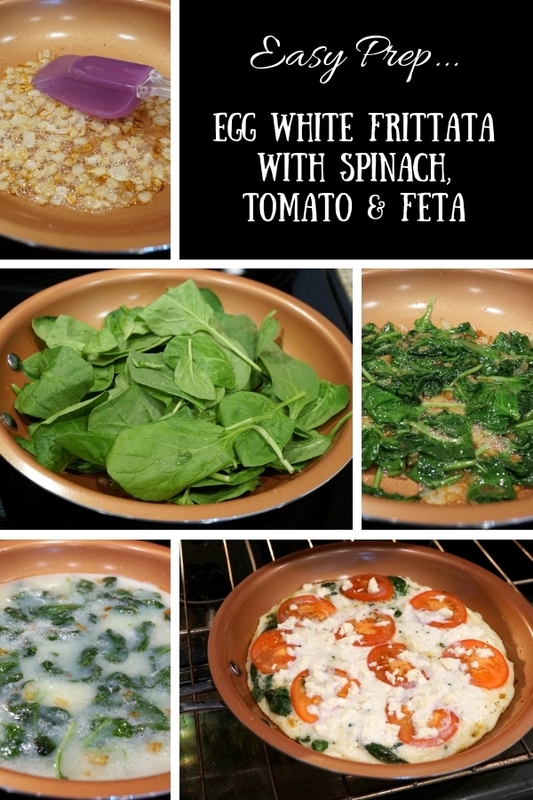 Pour the egg whites over the onion and spinach and cook, about 8-10 minutes, until the bottom is set. While cooking, lift the sides of the egg slightly to allow some of the raw egg to flow down to the bottom. Remove the skillet from the heat and place tomato slices on top of the egg mixture. Sprinkle with pepper and salt. Top evenly with crumbled feta cheese. Transfer the skillet to the oven and bake until the eggs are cooked through; about 8 minutes. Using an oven mitt, remove the skillet from the oven. 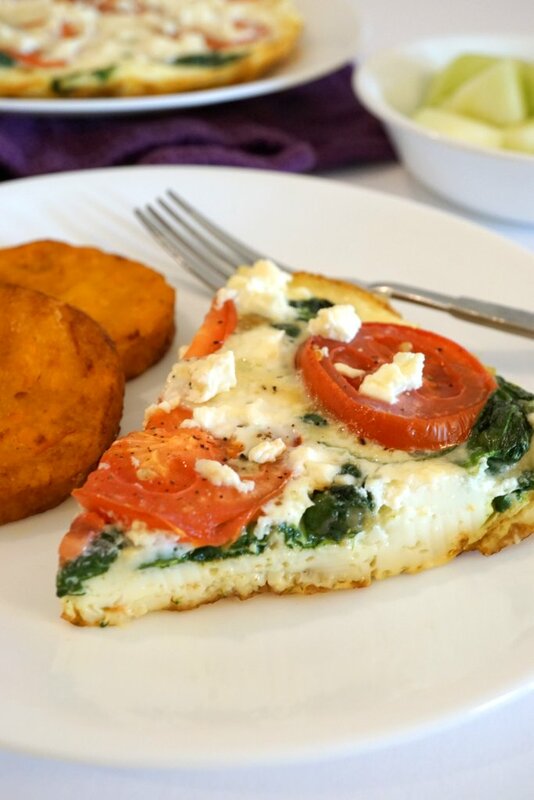 The frittata should easily slide onto a serving plate. Serve immediately. *On The Side: Serve with Sweet Potato Hash Browns or a small baked sweet potato (with a pat of butter and a sprinkle of cinnamon). Also serve your favorite melon, such as honeydew or cantaloupe, or any other type of fruit.